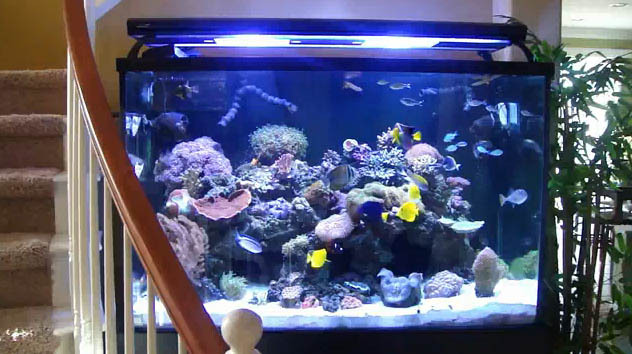 Here’s a great video of a 250 gallon reef system comprised of a 150 gallon display tank, a 50 gallon refugium, and a 50 gallon sump. This system is the result of an upgraded from a previous 75 gallons reef tank. The 50 gallon refugium is home to a beautiful mantis shrimp. Located at the bottom of a staircase, the beautiful display tank is home to a variety of tangs, wrasses, chromis, clownfish, sps corals, lps corals, zoanthids, mushrooms, and many other interesting little critters. Check out the diamond watchman goby feeding as it siffs through the sand. Several clams are beautiful as well as helpful in improving water quality. Enjoy.